Promedica24 offers round-the-clock live-in care and support. Our carer lives with your loved one, providing care and companionship and enabling them to live a happy, healthy and independent life in the home they love. "Not many of us relish the thought of being moved into a care home. Despite their considerable cost, the truth is that care homes are not set up to provide focused, one-to-one care but rather to meet basic needs in the most cost-effective way possible. Sadly, that’s the British care model. However, there is a better and more affordable alternative that’s widely used in other countries. It’s where elderly people are looked after in their own homes by a dedicated care provider who lives with them. This is termed “live-in care” – and its popularity is growing rapidly in the UK. We can provide care throughout the county, from Stroud to Bibury, and Tewkesbury to Dursley. Companionship and personal care plus advanced care for those with more complex needs such as dementia, cancer, Parkinson’s or stroke recovery. Support with coming home from hospital and respite care. You may be surprised to find that this level of care starts at just £695 per week. 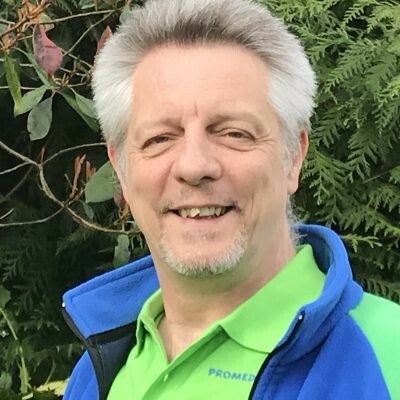 As a first step to arranging quality care in Gloucestershire, please call David on 07801 053743 or e-mail d.edwards@promedica24.co.uk for a friendly, knowledgeable and pressure-free chat about your requirements. As I’m local (Cheltenham) I will be happy to come to meet you in person if you’re comfortable with that. I look forward to speaking to you." Our CQC Supplier ID is 1-3306171695 and our Registered Company Number is 10552417. A real, affordable alternative to a residential care home - dedicated 24/7 live-in care allows your loved one to remain in the comfort of their own home.